Mr Francis Lim, president of the Singapore Motor Workshop Association, said the changes will "open up the market" and give car owners more choice. If the owner decides to take his car to an independent party instead - which means the authorised workshops will not have any servicing records - they can void the warranty, he said. However, this will not be the case any more, he added. Mr Nicholas Wong, general manager of Honda agent Kah Motor, said: "As long as the (independent) workshops are good and are able to do the work prescribed, I don't see why not." Mr Ron Lim, general manager of Nissan agent Tan Chong Motor, said: "To compete for the business, after-sales service is something we will improve on our end, in terms of professionalism and the turnaround time." Still, he added, cars are getting more high-tech, with lane departure sensors and forward collision warning systems. "(It matters to) manufacturers that customers receive appropriate repairs and servicing for the car, so it doesn't affect the vehicle's performance," he said. 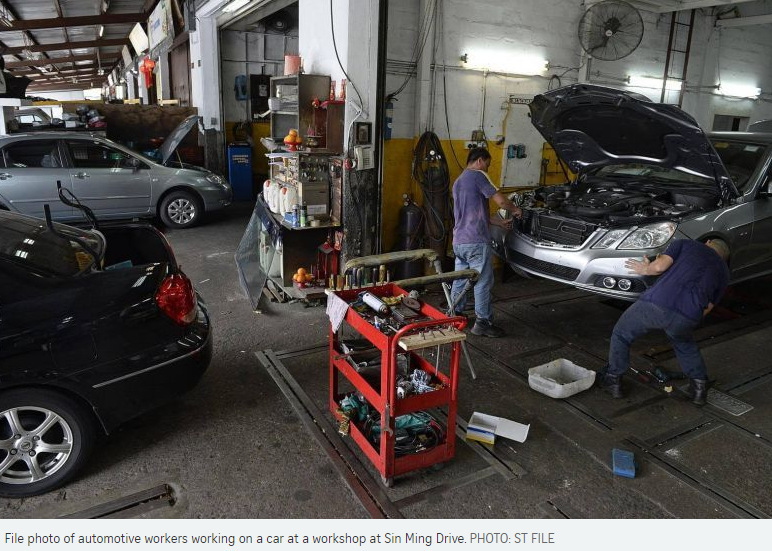 Mr Joey Lim, managing director of independent workshop Harmony Motor, who is also the Singapore Motor Workshop Association's secretary, said independent workshops will now have to beef up their technical know-how to service newer car models, which are typically those still under warranty. According to the association, which has more than 700 members, there are about 2,500 motor workshops in Singapore. To avoid warranty disputes, car owners are advised to keep proper records when they go to third-party workshops. The Singapore Motor Traders Association (MTA) said yesterday vehicle owners may find it difficult to make warranty claims for a defect or malfunction if this was caused by "any repair, servicing or other actions carried out by third parties". It said in a statement that authorised motor dealers have the right to reject warranty claims for parts "replaced or modified by third parties". The association's statement was in response to remarks made by the Competition Commission of Singapore (CCS) a week ago. The CCS said on Dec 11 that authorised dealers had agreed to remove a clause that voids warranty cover should a car owner go to a third-party workshop. The MTA said: "To avoid any complications when claiming warranty for vehicles not serviced by authorised motor dealers, motorists should keep proper records of their servicing." For example, they should keep detailed invoices of their vehicle servicing. The invoices should show proof of purchase of genuine parts (with part serial numbers). "These records would help support their warranty claims," the association said. It added that authorised agents may need to spend more time and effort going through vehicles which have not been serviced by them if a warranty claim arises. "This may result in longer downtime and additional cost to the customer," it added. The association explained why servicing at authorised dealers' workshops costs more than at third-party workshops. "A car is made up of some 30,000 parts and is an amalgamation of more than eight separate but interconnected systems. Every component or part has been rigorously tested by the manufacturer to ensure they complement each other so that the vehicle performs optimally. "Thus, using the proper parts, tools and equipment, and having the correct procedure and proper technique to service and/or replace the part/car are critical." Singapore Motor Workshop Association secretary Joey Lim said the MTA's requirements are "a must". "Parts must be genuine or from original equipment makers. Labour must be qualified," he added. Mr Lim also said the association is redoubling efforts to get its technicians qualified. "Spring Singapore is working on an automotive portal with us," he added. "In future, all mileage and invoice information will be captured digitally." Motorist Anthony Leong said he would go to an authorised agent when a car is under warranty. The 66-year-old business consultant said: "The question is accident repair. If it's just a minor body work, I might probably get it done outside. I'd go back to the agent if the work needed may jeopardise the warranty."